The concept of reclamation as the leitmotif of architecture that values and redevelops something that is already there is also coming to the fore in the field of landscaping. We have had the opportunity to share with our readers the experience of Harari Landscaping Architects in Guadalupe with the riverside nature reserve of La Pastora (link) and now, for the 2018 World Architecture Festival (WAF) currently underway in Amsterdam, we’re showcasing the Puyangjiang River Corridor by Turenscape, shortlisted in the Use of Colour category of the WAF awards. Pujiang, a small city located in eastern China with a population of 500,000 in the wider area occupies a basin through which the river Puyangjiang runs. For thousands of years, the Puyangjiang was a source of wellbeing, but ruthless and rapid industrialisation and urbanisation in the last four decades turned this idyllic river into a heavily polluted backyard dump. Its tributaries and watercourses were channelized and the riverbeds turned into sand quarries; the river no longer held any appeal for the community and it ended up as an ugly, foul-smelling, dangerous non-place. In early 2014, the local government, which was, of course, well aware of the problem, launched a campaign to improve the overall living environment of the city and Puyangjiang River was taken on as a pilot project, setting up a model. The winning concept in response to the competition was by Turenscape, a large, multidisciplinary Chinese firm with a team of 500+ professionals. 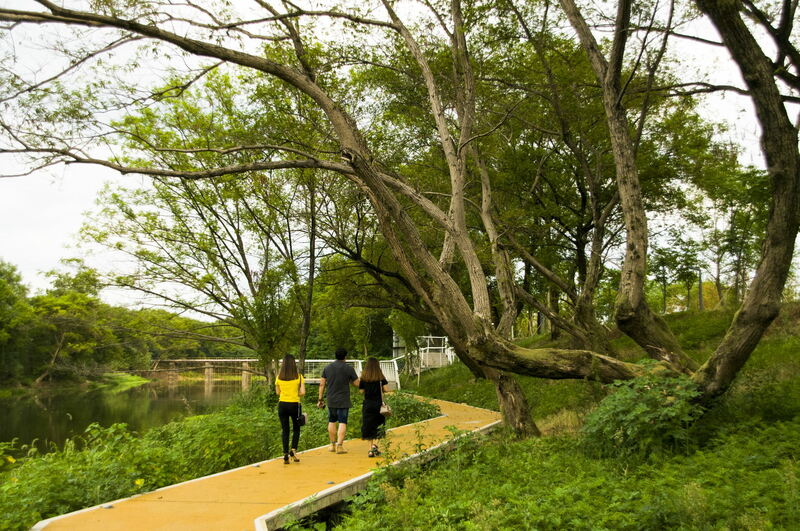 The designers came up with three different strategies to turn this 16-km long river corridor of approximately two square kilometres into a lush greenway that reconnects people with nature. The first thing the design team did was to take corrective action: they removed the concrete from the riverbank and remediated with resilient, flood-adaptive greenscapes that divert and buffer floodwaters and help cleanse them of agricultural runoff. At the same time, they were careful to preserve the existing vegetation that was integrated with new plant species. 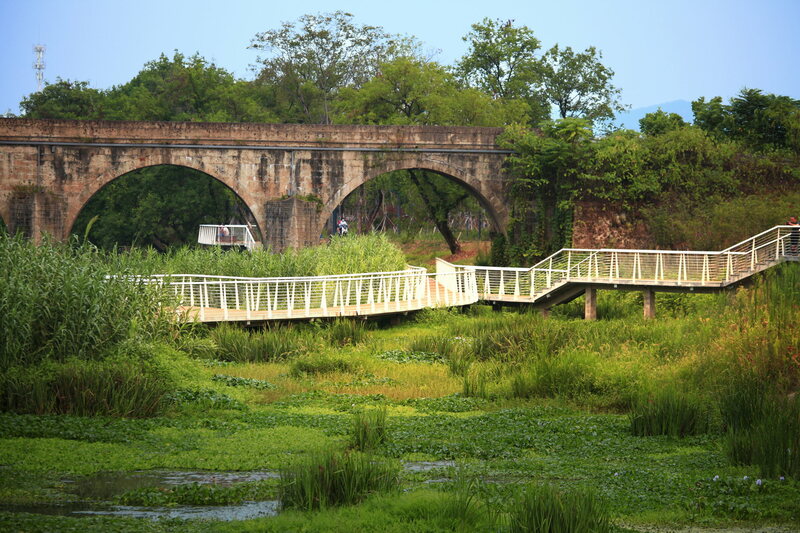 They also retained and integrated existing structures like bridges and aqueducts, adding new constructions like resting platforms and gathering places to foster connection of the Puyangjiang River Corridor with the city and to restore it to its former glory, engaging the community with brightly coloured pedestrian and bike paths. It has only taken three years for this project by Turenscape to turn the clock back in time, building the health of the river corridor with clean water and green infrastructure, restoring its dignity with a greenway that attracts thousands of visitors every day, all to the advantage of the local community who can once again turn to their river as a recreational facility, the river that played such an important part in the city’s history.